Client service, teamwork, and patient care are at the heart of our practice. Relationship-centered care, team work, and high-quality medicine are at the heart of our practice. Garden Oaks Veterinary Clinic is conveniently located for many Houston, TX residents, we hope you’ll give our animal and veterinary hospital the opportunity to shower your pets with the love and care they deserve! At Garden Oaks Veterinary Clinic, we believe that no two pets are the same, but that they ALL deserve exceptional care. That’s why we give thorough physical examinations, even for routine wellness visits, to make sure nothing is overlooked, and we tailor treatment to each individual pet’s needs. 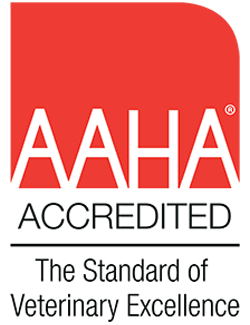 Garden Oaks Veterinary Clinic is proud to announce our accreditation with the American Animal Hospital Association (AAHA)! Garden Oaks Veterinary Clinic is proud to have a solid staff of animal lovers who are passionate about your pet’s health and wellness. First visits to a new doctor are stressful – whether you’re a human or an animal! For this reason, we strive to keep our patients AND their owners comfortable. Save time and quickly request an appointment with Garden Oaks Veterinary Clinic online. We can’t wait to see you and your pets!